If you hanker after the character of the Jupiter-8 for a modest outlay, the JP-08 delivers the goods. Originally launched in 1981, the Jupiter-8 was the pinnacle of analogue/digital technology at the time and was adopted by key players and artists, including Nick Rhodes (Duran Duran), Howard Jones, Michael Boddicker (the JP-8 was used for those huge chords on the intro to MJ'sThriller). Players loved the JP-8's polyphony, performance controls and stunning VCO sound but also, it was a well-built, well-engineered and well-featured, largely reliable board that looked fresh. With the launch of the JD-XA last year, we saw Roland's first analogue poly for many years (it's actually a hybrid as it has a digital engine too) and it's one fine sounding synth with that classy yet gritty Roland analogue character (DCO). Logically, Roland should simply box two of the JD-XA's 4-voice analogue boards into one unit to form a real analogue Jupiter-8-style successor; but, while we wait for that (crossing everything! 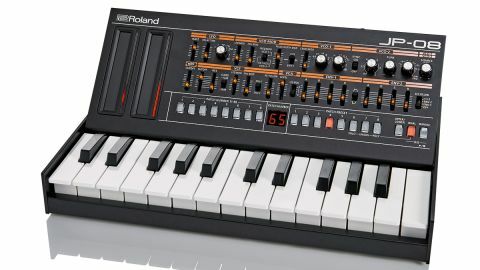 ), Roland has thrown us a lifeline in the form of the limited edition Boutique range. The daddy of the three new Boutique models is the JP-08 which uses Roland's acclaimed ACB (Analogue Circuit Behaviour) modelling technology to emulate the original Jupiter-8's circuitry and the way those circuits interact/behave. ACB has enabled Roland to package its classic sound engines into cheaper, more reliable modern products and the recent TR-8 and System-1 have demonstrated just how close to the real deal ACB can get. The first thing that strikes you when you see the JP-08 is how professional it looks and feels - it's a diminutive metal fronted, plastic box with sturdy feeling short throw, orange-lit sliders and solid dials. Longer sliders would be preferable but on the whole they work fine and it's good to have so much of the original's hands-on control in such a compact enclosure. Although it's harder to dial in more subtle values/sweet spots within just 1.5cm of slider travel, the sliders are fairly stiff, so you can be pretty accurate dialling things in as long as you move carefully. One thing to note here is that the panel controls don't transmit or receive MIDI CC data like most modern synths (although Mod-Ribbon, Hold and Expression Pedal CCs are received/ transmitted). The JP-08 transmits and receives using Sysex messages (which is infinitely more confusing to set up than CC data) just like the original Juno-106 and Alpha-Junos, so you'll need to make sure you work with a Sysex compatible DAW to send/transmit control data. This is a pain for studio integration, especially when most other synths today use CCs - at least there are some controllers that can be set to send Sysex data (including Novation's popular SL Mk2 range). As the unit is so compact, it fits nicely into a small rucksack, giving you a lot of sonic power to work with. On the move, on sessions or on stage this is a real bonus. However, there's a couple of notables! Firstly, there's no conventional over two rows instead of one) but adds a sine on VCO1, extended footages on both modelled VCOs and a triangle wave and noise as mod options on the LFO. It does miss the extensive performance control section though, which brought out the best from the Jupiter-8's engine. This has been replaced with two touch ribbons (one for pitchbend and one for global modulation and to switch on/control portamento/other hidden functions in combination with pressing Manual). We would have preferred a dedicated portamento control and two small/assignable panel mounted wheels, to make the panel more spaced out. The ribbons are also quite deeply set with a wide surrounding bevel, which makes them harder to perform accurately with. Also, there's seemingly no way to alter the depth of ribbon modulation independently or assign other functions to just the mod ribbon, so you'll likely prefer controlling the JP-08 using a MIDI/Sysex enabled controller instead. Selecting patches is done Jupiter-8 style, with eight preset buttons to the left (64 patches total) and eight patch presets (which contain upper/lower/dual patches) to the right which all glow a pinky-orange. Type in the patch you want and off you go, though there's no patch naming so you need to remember numbers. The Patch Number/Patch Preset buttons also work in combination with the Manual and Dual buttons to select hidden functions (as listed in the compact manual) and to choose from solo (legato mono) unison (stacked mono) and poly (4-voice chord) modes. The buttons also act as 16-step buttons for the sequencer. Now the sound! As it's a modelled 4-voice synth and the original Jupiter-8 was a real-analogue 8-voice, there are differences in terms of the sonic weight/ width, especially in stacked modes such as unison and poly. Put simply, the JP-08 sounds more compact than the original as fewer voices/notes can be stacked. This is apparent in dual mode where the JP-08 hard pans a lower patch to the left and upper to the right - you can only have two voices here vs four (original) on each side of the spectrum, although the effect of two patches layered, even with just two voices each side is still very pleasurable. Sonically, the JP-08 gets right in the ballpark of the original Jupiter-8 and displays that recognisable smooth yet gritty character in terms of its filters (HPF and 12/24dB LPF), modulation and waves. It excels at cross-modded/ sync sounds, evolving leads, bold brass patches and lush pwm-driven pads. The thing most lacking is the amount of 'air' around the sound and the unmistakable width/sizzle/ movement that you find with real-analogue VCOs/VCAs/VCFs. The JP-08 sounds darker and less lively, perhaps partly due to the Boutique's 24-bit, 44.1kHz engine - the System-1 runs at 96kHz and has a more 'open' sound to our ears. However, it's still a strong machine (especially when paired with the K-25m keyboard) and captures the overall essence/mojo of the Jupiter-8 well, albeit with four voices. It's certainly whet our appetite for the 'bigger things' that must be in Roland's design lab right now and, whether the inevitable 8-voice synth that eventually drops is ACB-based or analogue, based on this, it'll surely sound great.